Banská Štiavnica was an important silver mining town, and Jews were barred from living here until the ban on Jewish residence in mining towns was lifted in 1859. The Jews of Banská Štiavnica were prosperous business people and managed to integrate well into the town's German-speaking middleclass society. The community belonged to the Neolog movement. The flat-faced synagogue, built in 1893, has recently been restored. Before the Holocaust, the Jewish population of Banská Štiavnica numbered more than 400 people; today only one Jew lives here. The Jewish cemetery, owned by the municipality, is part of the Slovak Jewish Heritage Route. 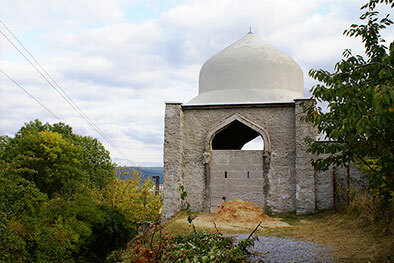 It has recently undergone restoration, thanks to input from the Union of Slovak Jewish Communities and especially to a civic initiative led by a local secondary school teacher, Dr. Beata Nemcová. The cemetery occupies a beautiful location on a hillside above town, spread out over a descending, partially terraced slope. Tombstones are simple, reflecting the urban taste of the nineteenth and early twentieth centuries. The epitaphs are mostly written in German and Hebrew, but Hungarian and Slovak inscriptions can also be found. The cemetery chapel still stands, and its elaborate, Moorish-style dome is a local landmark. The rectangular building originally served as both the entrance to the cemetery and the ceremonial hall for funerals. Long neglected and in danger of collapse, it is currently undergoing full restoration. Location: Novozámocká Street, bellow the New Castle, a short walk from the bus station.